The Ripley Wolves improved to 3-1-0 with a 5-3 win in Saugeen Shores on Friday night. Mitch Campbell got the start in the Wolves net and was stellar, stopping 38 shots for his third win in his rookie season. The Wolves jumped out to a 3-0 over the first 1 1/2 periods, with goals coming from Tyson Soers, Cody Britton and Jarred Colling (shorthanded). Assists went to Colling, Drew Davidson and Tyler de Vos. Saugeen Shores closed to gap to 3-1 late in the second, but the Wolves’ Davidson responded quickly, from David Jones and Brett Catto, to give them a 4-1 edge heading into the third. Saugeen Shores tried to make it close in the third, closing the gap to 4-2 with 13 minutes remaining in the game, but Catto scored on the powerplay from Jeremy McQuillin to put the game out of reach. The Winterhawks scored one more with seven minutes to go, but the Wolves defence shut them down from there en route to the 5-3 win. The Wolves travel to Drayton to face Mapleton-Minto on Friday night. Game time is 8:30 p.m. They return home after nearly a month on the road next weekend, with a Friday night game against Durham at 8:30 p.m., and a Saturday, Nov. 7, tilt with Shallow Lake at 7:30 p.m.
Don’t forget to ‘friend’ the Wolves on Facebook and follow us on Twitter @RipleyWolves for updates. The Ripley Wolves lost a heartbreaker on Friday night in Shallow Lake but rebounded for an ovetime win on Saturday night in Shelburne. The Wolves gave up two goals in the last 29 seconds to lose 5-4 to the Shallow Lake Crushers on the road. Until that point, Ripley had played a strong game and were poised for the win until the wild last half-minute. The Crushers scored to tie the game, then goalie Jamie Bailey stopped and penalty shot, but was then scored on in the dying seconds for the 5-4 loss. Ripley’s goal scorers were Tim Dwinnell, Cody Britton (2) and Drew Davidson. Assists went to Jeremy McQuillin (3), Dustin Catto, Brian Stanley, Britton and Davidson (2). Jamie Bailey played a strong game in net, stopping 33 shots and coming very close to his first win as a Wolf. On Saturday night, the Wolves looked to bounce back in Shelburne. The teams traded two goals each in the first with Brett Catto and Dustin Catto scoring. Assists went to Alex MacLeod, Dwinnell and Ryan Dudgeon. The Wolves trailed 3-2 heading into the third, but they fought back with a powerplay goal by Tyler McCarthy, assisted by Britton and B. Catto. Tyson Soers scored a shorthanded goal with just under seven minutes left in regulation to give them a 4-3 lead. That lead was short-lived though, as the Muskies scored with four minutes left to send the game to overtime, where Davidson scored to give the Wolves their second win of the season. Assists went to Soers and Stanley. Mitch Campbell earned his second win on the season in the win, stopping 49 shots. The Wolves are now 2-1-0 and travel to Saugeen Shores on Friday, Oct. 23, for an 8:30 p.m. start. Don’t forget about the Howling Halloween Dance, featuring The Mudmen. It is Saturday, Oct. 31, at 9 p.m. at the arena. Tickets are $20 and available at Ripley Variety and the arena. 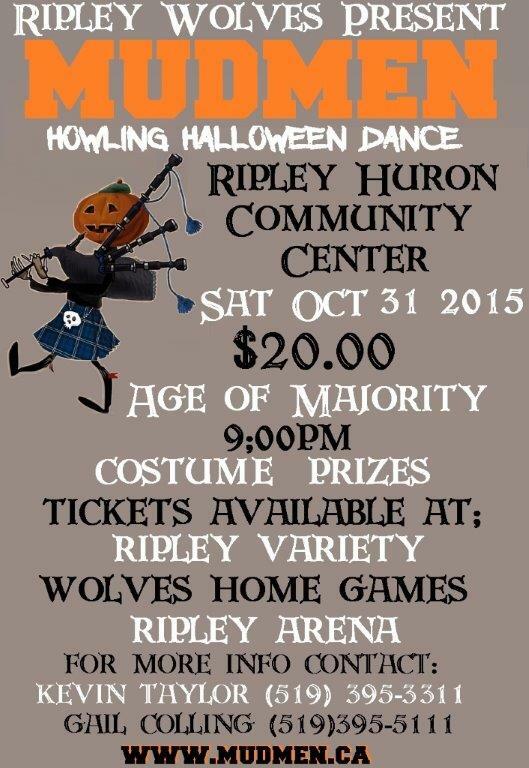 The Ripley Wolves and The Mudmen will be holding their second annual Howling Halloween Dance on Saturday, Oct. 31, at the Ripley arena. Doors open at 9 p.m. Prizes for best costume. Tickets are $20 and available at the arena during business hours, Ripley Variety and the Wolves Oct. 10 home game vs the Lucknow Lancers.